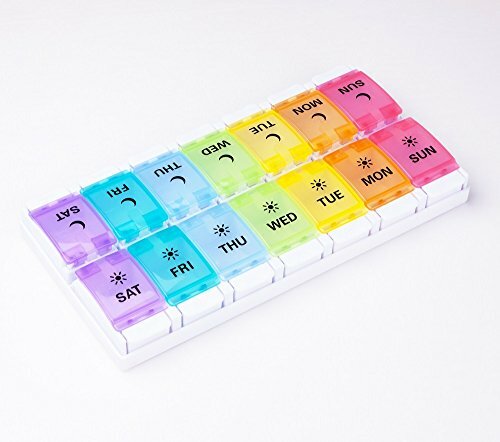 · Large 7 day pill boxes and organizer: Dimensions is approximately (L*W*D) 8.8"*4.4"*1"
2 Times a Day 7 DAYS MEDICATION PLANNER: 14 compartments with rainbow colors and week day lables, make managing your weekly prescription medicine simple. DURABLE & SAFETY: Our medication organizer made of high quality plastic, BPA-free, safe for medical use. EASY FOR CARRY: Suitable size,convenient to carry, great travel pill box or work time pill planner. 100% MONEY BACK if you are not satisfied with our product. If you have any questions about this product by DANYING, contact us by completing and submitting the form below. If you are looking for a specif part number, please include it with your message.